An intense typhoon that meteorologists have called a “near-perfect storm” ripped through Taiwan today, leaving a trail of destruction, dozens injured, and two deaths in its wake. Typhoon Nepartak, which takes aim for China next, pounded the island in torrential rain and wind gusts of over 150 miles per hour. Videos that surfaced across the web show the terrifying storm overturning cars, toppling trees, and even stripping roofs off buildings. Super Typhoon Nepartak developed in the Northwestern Pacific Ocean, the world’s most active tropical cyclone basin that generates a third of all tropical cyclones and some of the strongest storms on Earth. Nepartak is most noteworthy on two counts: first, the tropical cyclone ended a record-tied 199 day stretch without storms in the basin; and, when viewed from above at peak intensity, the compact storm took on a symmetrical shape with a well-defined pinhole eye, earning the storm its “near-perfect” description. 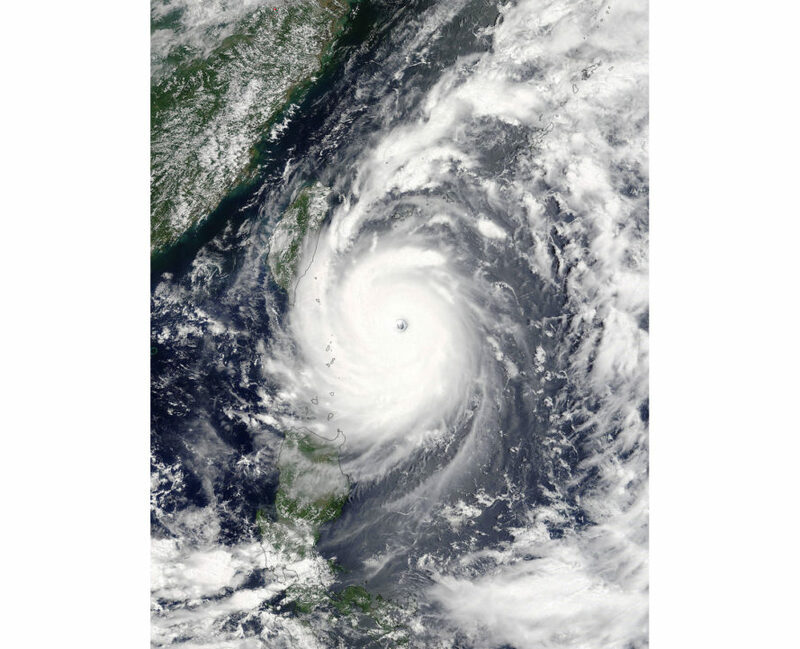 Its symmetrical appearance was formed by low vertical wind shear and unusually warm waters, parameters that helped propel the cyclone from a mild storm to a Category 5 super typhoon in just three days. Nepartak made landfall on Taiwan’s east coast at 5:50 AM as a Category 4 storm on Friday, leaving nearly 50,000 households in Taitung without power. The storm traveled westwards towards Kaohsiung City, then northeast towards Tainan, before it left the island and entered the Taiwan Strait. The capital of Taipei was relatively unscathed, while the east coast sustained the most damage. Nepartak has now been downgraded to a Category 2 as it travels to China and is expected to make landfall in Fujian province before it moves north towards Zhejiang Province. Typhoon Nepartak, which takes aim for China next, pounded the island in torrential rain and wind gusts of over 150 miles per hour. Super Typhoon Nepartak developed in the Northwestern Pacific Ocean, the world’s most active tropical cyclone basin that generates a third of all tropical cyclones and some of the strongest storms on Earth.